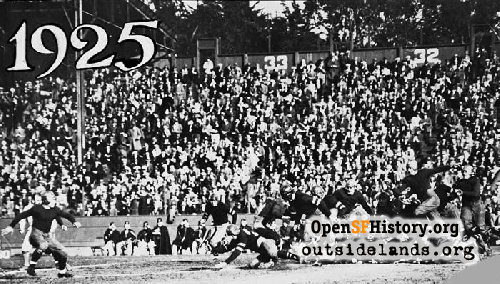 In 1938, SF Chronicle columnist Will Connolly remembers the highlights of an old stadium. View east from Lone Mountain of Ewing Field and Calvary Cemetery, 1914., 1914 - Courtesy of a private collector. Originally appeared in the San Francisco Chronicle, June 18, 1938, Page 1H. Although an excellent piece has been done on Ewing Field, there is still ample space to chant the obsequies of a turf dampened by the sweat and blood of two generations of San Francisco athletes. A routine story from the city side tells how old Ewing has been condemned by the municipal beautification committee to make room for homes with orchid bathrooms. I confess old Ewing Field, at Masonic avenue and Turk street, has been an eyesore for the past two decades and should be cleaned up before the 1939 sightseers visit our town, but just the same, I feel a twinge of regret at the demise of the historical athletic plant. Ewing Field was named for J. Cal Ewing, the biggest name in Coast League baseball before Charlie Graham and associates bought the local franchise. It was founded primarily as a baseball park against the sober advice of less romantic men whose practical judgement proved to be right. 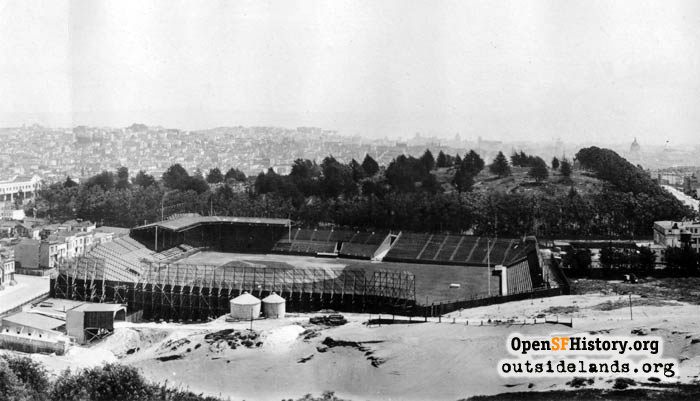 Ewing Field was opened as the home of the San Francisco Baseball Club about 25 years ago. 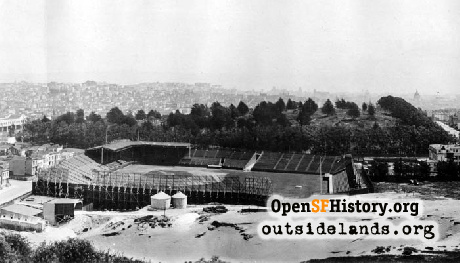 The fog and damp weather were so hostile to pleasant baseball that the site was quickly abandoned for the warmer clime of Old Rec at Fourteenth and Valencia streets. This era around 1915 was before my time, but Howard Smith, a fine old character, recalls that Pete Daly, a centerfielder, had to build a fire with newspapers to keep warm while patrolling a beat, and Elmer Zacher, outfielder for Oakland, was so confused by the fog that they dispatched a mascot from the bench to inform Elmer the side had been retired and it was his turn to bat. I trust the Junior Chamber of Commerce and Californians Inc. do not take umbrage at my honest reflections of San Francisco's foggy weather. If I were in charge of publicity, I would sing the virtues of fog to the skies. I just got back from the valley heat of Bakersfield and I know whereof I speak. Every San Francisco athlete not over 40 should be in love with ugly old Ewing. This affection extends from dub golfers to footballers, soccer men, baseballers and amateur gate crashers. In recent years the field degenerated into a practice lot for goof golfers, although it always retained the distinction of being the easiest gate in North America to crash. For more reasons than one, I'm sorry to see Ewing pass. It was the kindergarten wherein juvenile gate crashers and tight wad hill squatters learned the art of busting through the more difficult barriers of Kezar, Berkeley Memorial Stadium, and Stanford. Some of our most talented gate crashers earned their diplomas on the easy pine board fences of Ewing, a training that stood them in good stead in later years when the Pinkerton cops were more alert. Lone Mountain, an abrupt pile of sand directly overlooking Ewing, afforded tightwads invaluable experience in the science of seeing important games for nothing. Some of the alumni of Lone Mountain won Ph.D.'s for their post graduate work in seeing Big Games between Stanford and California from Strawberry Hill, also for nothing. The Smithsonian Institution will be interested to know that Mac McCormack sold the first hot dog from a portable stove in the history of American baseball at Ewing Field 24 years ago. The event was so important that Mac rehearsed for three days before the formal opening of the new park, to prevent the possibility of the alcohol stove blowing up the bleachers. In that dim age, the indigestible frankfurter, fried in olive oil, was a dangerous experiment although the lowly provender has since become a staple food at sporting events. The first Shrine game for crippled kids was played in December of 1925 at Ewing. For the East there were Ed Slaughter of Michigan, Bill Ingram of Navy, Loug Wyckoff of Georgia Tech, Ed Garbisch of Army, Lavern Dilweg of Marquette, Ted Sloan of Drake. For the West there were Norm Cleaveland of Stanford, Jimmy Bradshaw of Nevada, Tut Imlay of California, Brick Muller of California, Babe Horrell, Jimmy Needles, Percy Locey, Buck Bailey, Jack Patrick. Remember? Old Ewing saw the longest punt in the record books, made by Len Casanova, left-footed halfback for Santa Clara—more than 105 yards, with the roll—and Walter Camp was there to see it with his own eyes. Mr. Camp nominated Norman ("Red") Strader as his All-American fullback for the good work "Red" did in that early St. Mary-Santa Clara game, then a bush league struggle attended by only 8000 souls. Old Ewing's turf is stained with the blood from Russian noses, punched by Italian soccer players, and by Italian gore let loose by Sunday punches from Scottish soccer men in the delightful quarrels that enlivened games there. The board fences heard the hysterical shrieks of that dark day in 1927, when Lowell High's football team beat Galileo, 12 to 7, after trailing 7 to 0, until the last three minutes. Two forward passes in the autumnal gloom to Ham Hedges, when it was too dark to the see the ball, won the championship for Lowell. This was, without doubt, the most exciting prep football game in our old town's existence and Ewing harbored it. There was a day in either 1924 or 1925 when Potter and Cogswell, since passed from the prep picture as athletic powers, played in the worst rainstorm to visit our town in a generation. It was so muddy that the ball carrier was guaranteed making the required 10 yards merely by skidding on his chest after being tackled. There was the Thanksgiving day when U.S.F., then St. Ignatius College, inaugerated its football series with Loyola of Los Angeles and it rained cats and dogs. 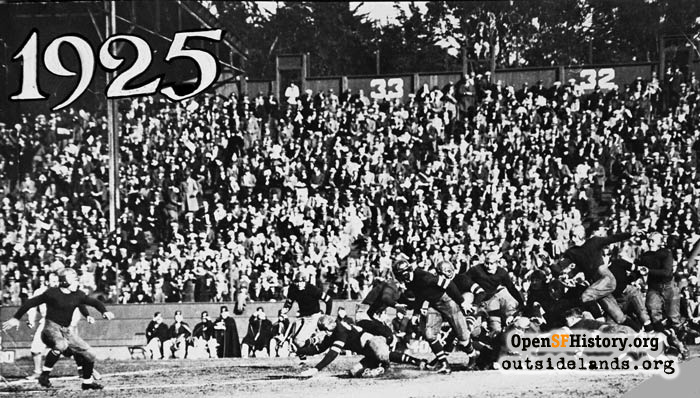 The ball was so slippery that Bill Young, halfback for St. Ignatius, punted on second down and swung his foot three times without touching the oval. It was the only clean strikeout in football annals. It's just as well that they're going to knock down old Ewing and build homes on the lot with sun porches and gaudy tile bathrooms. All the fun has gone out of the gloomy place. The fences are crumbling, so not even a minor league gate crasher would stoop to climb over the decrepit boards. They've built a young ladies' seminary on top of Lone Mountain, so a tight wad hill ticket holder, if he has any pride at all, wouldn't bother to climb the height lest the dean of women offer him a Morris chair. Page launched 8 August 2009.